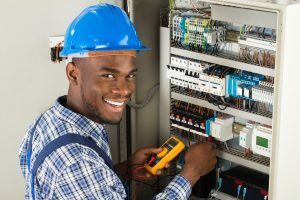 Maintenance scheduling software that automatically emails preventive maintenance task lists, work orders or any other report with time-sensitive data. Maintenance scheduling software is CMMS software that is used to schedule preventive maintenance tasks, work orders or any other report. These reports are generated with a time-sensitive filter (where applicable) by the maintenance planner. This post explains how to configure the outbound email server so that the CMMS can send email, either manually or automatically. Consider the benefits of an automatic scheduled maintenance email sender. Provides consistent issuance of preventive maintenance. Time-sensitive nature of the automatic email system means the reports and tasks lists sent are always timely. Flexible scheduling by weekday, day of month, count of days and weekday sequence in the month ensure that the maintenance manager can always generate the needed CMMS report schedules. Option to either email or print (or both) . The maintenance scheduling software email scheduler is configured by linking one or more user IDs to an outbound email server. If a user has a email address linked to the user ID and this email address is identified as being an outbound email address used for sending mail then that address is used. Otherwise one email address may be designated as the Default Email Sender. The CMMS software program tries to use the logged in users email credentials, however if none exist then the default sender credentials are used. This ensures that email can always be sent, one way or another. A typical way to use this email component is to have one sender. Perhaps this sender is named "Maintenance". All email could be sent from this sender is set as the default sender. All received email would be marked as coming from "maintenance" in this case. Other setting include which file attachment format to use when sending email. The default is Adobe Acrobat since this is a widely popular format accessible to most software users. Other formats include Excel, MS Word, Web Page, Rich text Format and many others. Additionally a delivery notification could be requested by default, the email priority may derive its setting from the work order priority or the email priority may be set by default for the user. 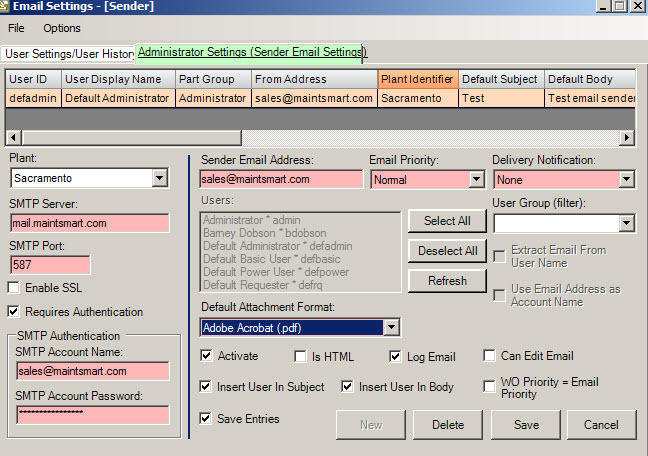 If using just a default email sender to send all email then it makes sense to activate either the Insert User Name in Subject or Insert User Name in Body. By setting one or both of these settings even though a default email sender is used the email still shows who sent it by listing their user-friendly name on the email. Although using just one default sender for sending email makes this email component very easy to set up there is a downside. For one thing all default settings for all email being sent would use the same default settings. Alternatively if each user has email sender credentials then each of these users could set their own preferences and defaults. When manually sending, in particular, it is useful to have the sender name show up on the email received by the recipients. In this case, using either Insert User in Subject (setting) or the having user actually linked to sender credentials of their own makes sense. This powerful maintenance scheduling software module has the ability to extract the text data from a report and then embed it into the email body. In the situation where file attachments are not desired then simply send a text email with the report data or preventive maintenance task list embedded into the body of the email. The automatic email scheduler sends our reports, preventive maintenance task lists, work orders and many other date sensitive CMMS reports automatically. Once the email or print job is set up the system continues to issue the appropriate report with timely data on the user specified interval with no other user intervention needed. It is fully automatic. This system saves time, provides consistency and save money by always making certain the correct report or work list is sent to the correct person or printer. Never again will the maintenance planner need to worry about assigning work orders, preventive maintenance task lists, restocking lists or any other report. All of these items generate automatically, accurately and consistently. This phenomenal utility is integrated into the software program and available at no extra cost.